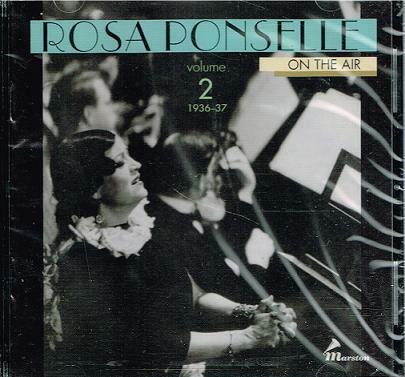 "This is a continuation of Vol 1 by Marston of broadcast transcriptions by Ponselle. Most are taken from 16" acetate discs recorded at 33 1/3 rpm. In general, these were made for delayed broadcasts or later audition. In some cuts there is random noise, like walking thru underbrush, but you can hear thru to reasonably high fidelity recording. 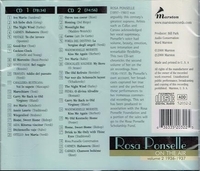 In most cases Ponselle's very large voice is well accommodated, with distortion only on fortissimo notes. The tone is not as mellow as she was given by Victor engineers, but she has a more relaxed and expansive feeling; in this setting SHE was in control, rather than the conductor, and the live audience encouraged her. There is a mixture of her favorite opera and operetta arias, and some popular items, together with soundtrack recordings from screen tests. 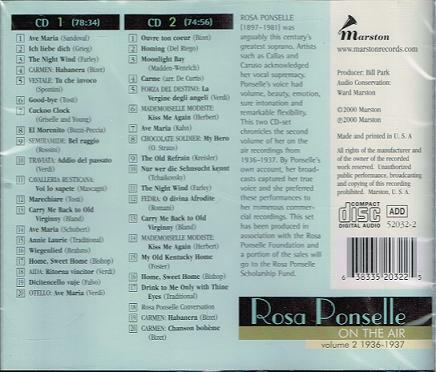 Actually, the operetta recordings are some of the most interesting items, hearing them done to a turn. Her voice is in full flower here, wondering whether any later transcriptions are out there. In the meanwhile, enjoy these to the fullest!"